The Asian longhorned beetle battle continues in some states, and a new area is deregulated. Asian longhorned beetle is a large, glossy black beetle with white spots and white banding on its antennae. Photo by: Dennis Haugen on bugwood.org. USDA APHIS continues to monitor and conduct control efforts in areas where Asian longhorned beetle is established. They recently released a statement that they were “removing 28 square miles from the Asian longhorned beetle (ALB) regulated area in the eastern part of Queens, New York”. Quarantines are usually lifted after surveys have not turned up new beetles or damage in the quarantine for a certain number of years. We do not have any infestations of Asian longhorned beetle in Wisconsin that we’re aware of, but it’s necessary to stay vigilant. 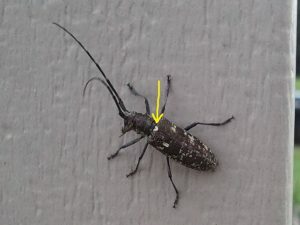 Our native Whitespotted Sawyer, or Pine Sawyer, has a white spot at the base of the elytra (yellow arrow) that Asian longhorned beetle does not have. Every year I get several reports of insects that folks suspect are Asian longhorned beetle, but so far they’ve always turned out to be our native Whitespotted Sawyer (sometimes called Pine Sawyer), which attacks conifers. 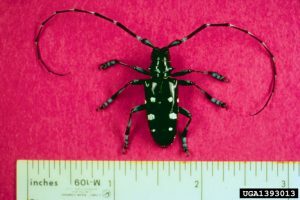 If you find a beetle that you suspect may be Asian longhorned beetle, please take some pictures and send them to your forest health specialist, or to the UW Madison Insect Lab for identification. Asian longhorned beetle can be very destructive, and attacks maple and other hardwoods. It can be accidentally introduced to a new area via wooden pallets, wood packing materials, or firewood. The closest infestation to Wisconsin was Chicago, but that was declared eradicated in 2008. Other areas to eradicate Asian longhorned beetle include Islip, NY, in 2011, Manhattan and Staten Island, NY, in 2013, Boston, MA, and a site in New Jersey in 2014, and now this portion of Queens, NY this year. There are still several infestations in the United States that are being controlled, including Ohio with a 60 square mile quarantine, Massachusetts with 110 square mile quarantine, and New York with a quarantine of 137 square miles. Let us know if you see something you suspect is Asian longhorned beetle. ← Large gypsy moth caterpillars now present; mating disruption treatments begin.